KUALA LUMPUR (Oct 1): The FBM KLCI reduced losses to end 0.99 point or 0.05% lower. The KLCI fell in line with regional markets as investors remained cautious on the protest in Hong Kong. Malaysia's KLCI settled at 1,845.32 at 5pm as banking stocks like RHB Capital Bhd and Public Bank Bhd fell. Sam Ng, remisier with InterPac Securities, said small to medium capitalisation stocks continued to be in focus. Ng, however, said there had not been much activity in blue chips. “The focus will probably be on small to mid cap stocks for the week, and currently traders are doing some profit taking on the penny stocks,” he told theedgemalaysia.com. Bursa Malaysia saw 2.23 billion shares valued at RM1.64 billion traded today. Decliners beat gainers at 562 versus 277, while 287 counters remained unchanged. Leading decliner was United Plantations Bhd while top gainers included Pintaras Jaya Bhd and Tasek Corp Bhd. The most-active entity was Sanichi Technology Bhd warrant (SANICHI-WC) with some 235.7 million units traded. 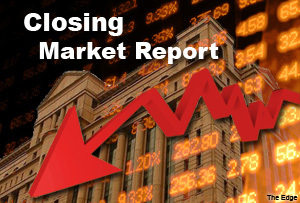 Across Asia, South Korea’s Kospi fell 1.41%, while Japan’s Nikkei declined 0.56%. According to Reuters, Asian shares slumped on Wednesday as continued civil unrest in Hong Kong and a downbeat day on Wall Street sapped confidence, while the dollar index was close to a four-year high after marking its best quarterly gain in six years. Trading in Asia was subdued with China closed for National Day and investors warily monitoring Hong Kong's pro-democracy unrest, as thousands of protesters stepped up pressure on the city's pro-Beijing government. MSCI's broadest index of Asia-Pacific shares outside Japan was down 0.3 percent, though above session lows.